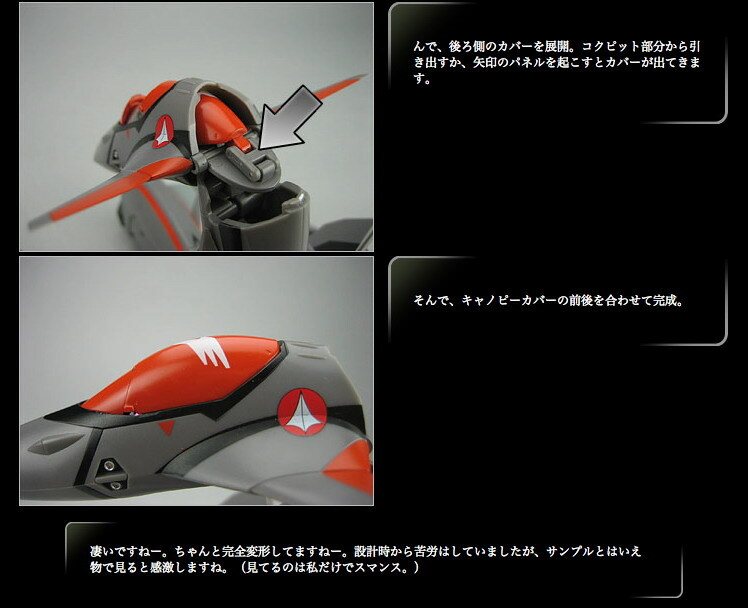 Yamato has finally unveiled how the heat-shield works on their upcoming 1/60 scale VF-11B from Macross Plus. Unlike the previous 1/72 version, the 1/60 version has a heat-shield that is stored internally. 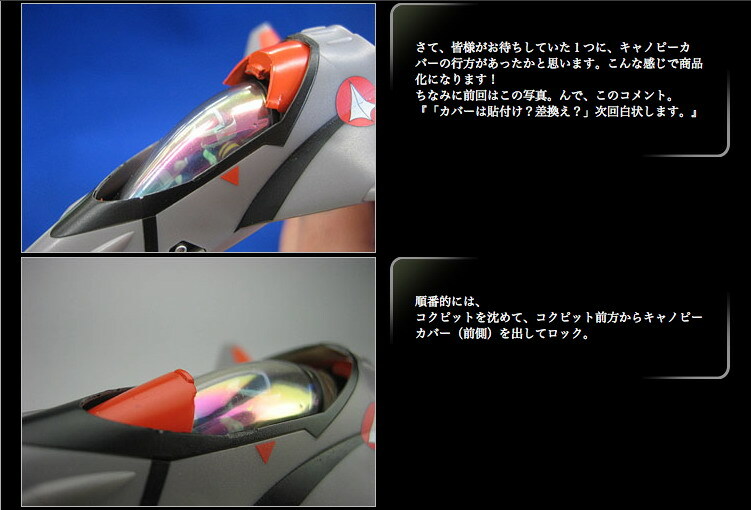 This shield emerges when transforming the toy to battroid mode. 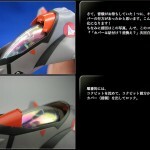 This release rounds out the 1/60 Macross Plus series from Yamato. Expect repaints in the future, possibly from such series as VFX-2. Click on the title bar to see the images which show how the shield functions! This toy is set for release in spring. It includes a removable cockpit capsule. 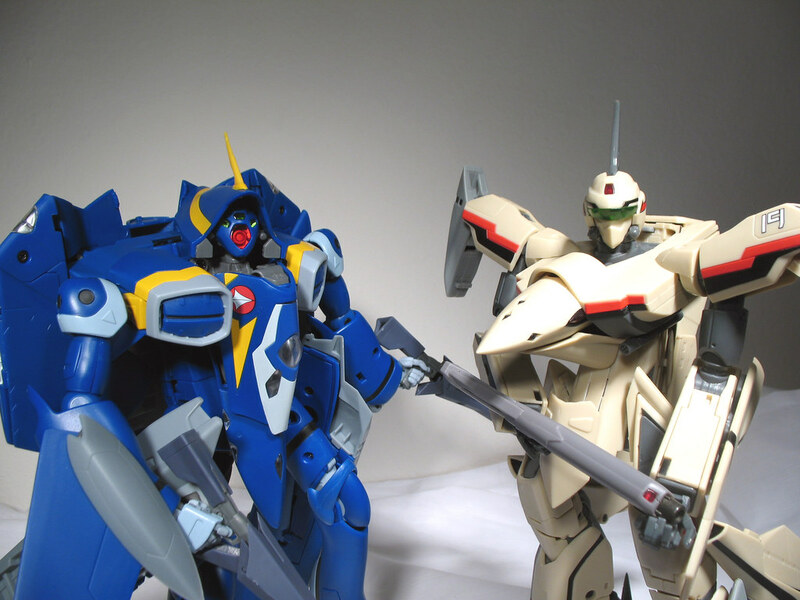 Kawamori Shoji retconned the size of the VF-11(during Macross Plus/7 he made the measurements of the VF-11 very close to that of the VF-1), so it will be significantly bigger than previously thought. Just how much bigger will it be though? Will it be the size of the other Macross Plus/Zero valks? A popular valkyrie, the VF-11B was used by Isamu Dyson in Macross Plus. Isamu was a reckless ace pilot, with an astronomically high kill ratio. He is chosen to be a test pilot for the YF-19 Excalibur, but before flying it, he flies a VF-11B chase plane to monitor Guld Goa Bowman's YF-21 during testing. The VF-11 was also used in Macross 7, where the C model was the cannon fodder mecha of the UN Spacy. The new 1/60 model is Yamato's latest attempt to make a VF-11 toy after 8 years. 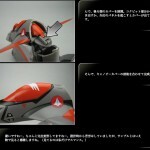 Man that is so awesome, and next to the YF-19 is my fav Macross toy of all time so I cant wait for this one. Yay, this one will complete my Macross Plus 1/60. This is a more accurate VF-11 than Yamato's previous VF-11 from 2000. Though this one looks superior in many respects, I hope larger vertical stabilizers and wider canards are added before final production. GA Graphic has more pictures of the VF-11B Thunderbolt III, including some that were never seen before!. Click here to check them out! I'm a big Macross Plus fan so color me interested! It's funny how tastes can change. Back when the first series of 1/72 M+ toys came out I liked the VF-11 the least of the three. Now I'm finding myself liking it the best of the three. Maybe it's because it doesn't have any junk hanging off of it in battroid mode like the 19 and 21. In any case, I'm very much looking forward to this bird. Weather or not it is afflicted by Yamatosis remains to be seen. I'm a Macross Plus fanboy, so I'll get one eventually to go with my 19 and 21, both of which I love. Yeah. You flaunt your unbroken yamatos. Go ahead. Mock us poor bastards with broken toys. We don't mind. finally something new instead of another VF-1. The tail fins are bearable, could be bigger, I dig the dark color scheme, always liked it that way. However I'm waiting for VFX-2 colors(which I hope we see). Yamato already repainted the GN-U Dou figure in those colors so it is in the realm of possibility. And man this toy is expensive too! I'm still praying Yamato makes a VF-17 myself. Keep praying... The VF-17 is a Macross 7 license, which means it's all Bandai's.